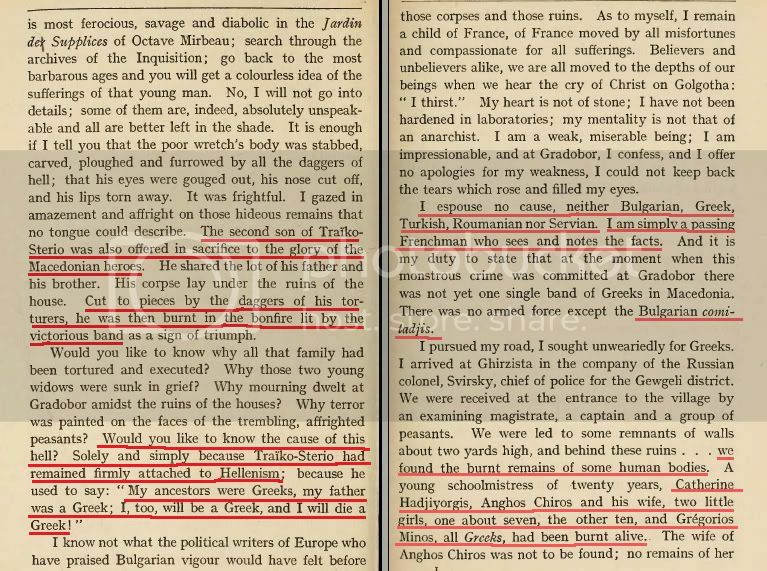 Account by a Frenchman self-witness who found himself in Macedonia and specifically “to Demir-Hissar, to Barakli-Djoumai’a, to Serres, to Nevrocop, to Razlog, to Djumal-Bala, to Melnik, to Petritch, to Drama, to Cavalla, to Niaousta, to Vodena, to Sorovitch, to Clissoura, to Kastoria, to Monastir, to Megarovo, to Tirnovo, to Florina, and to a hundred villages. 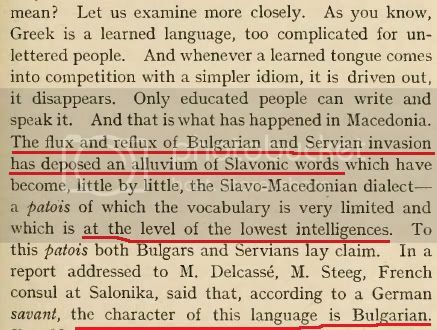 About Macedonian children and their ethnicity. 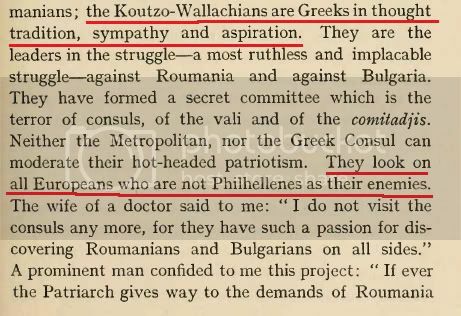 a) The Komitadjis were undoubtedly solely Bulgarians. 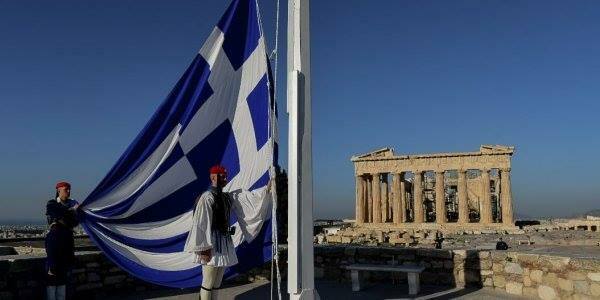 Traiko-Sterios had proudly stated: "My ancestors were Greeks, my father was a Greek. 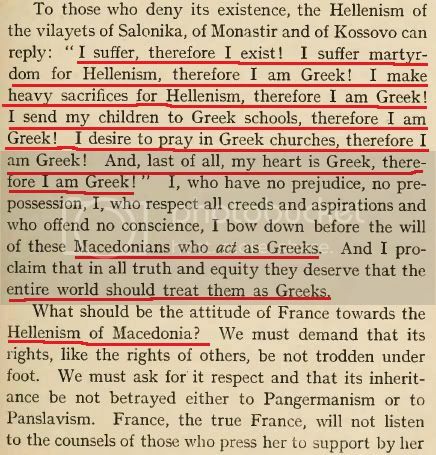 I, too will be a Greek and will die a Greek!!" 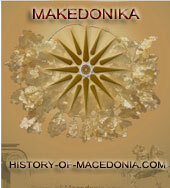 b) The Greek population of Macedonia suffered quite a lot of them. 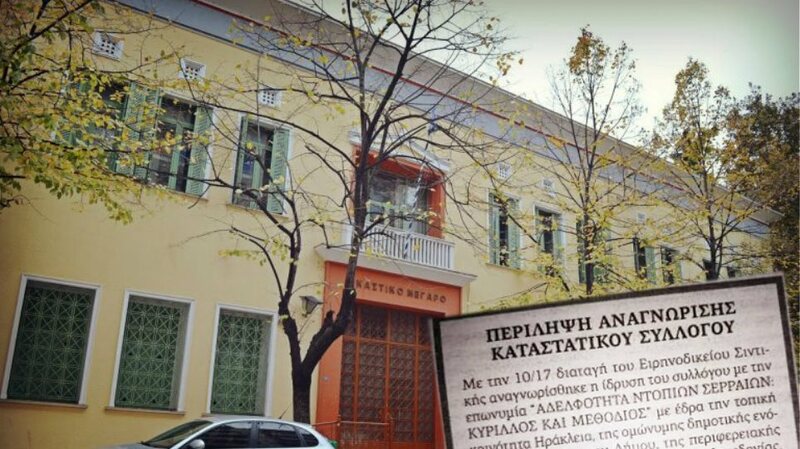 In fact the oppression from Komitadjis forced many into creating Greek bands fighting back. 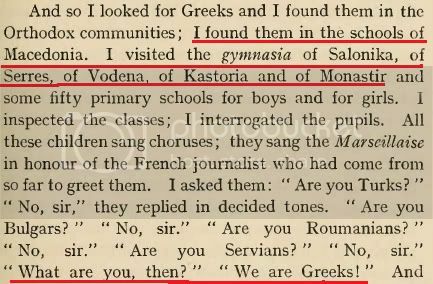 c) The moronic claim of FYROM ultranationalists there were NO Greeks in Macedonia prior to 1912 is pure crap. 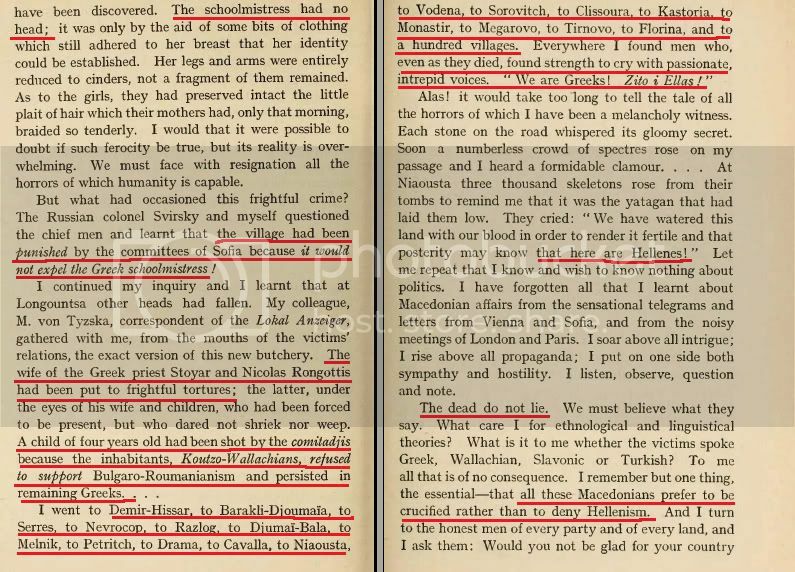 d) The intent of the Bulgarian “committees” was to imbue this population with a “non-Greek conciousness” by sword and tortures. 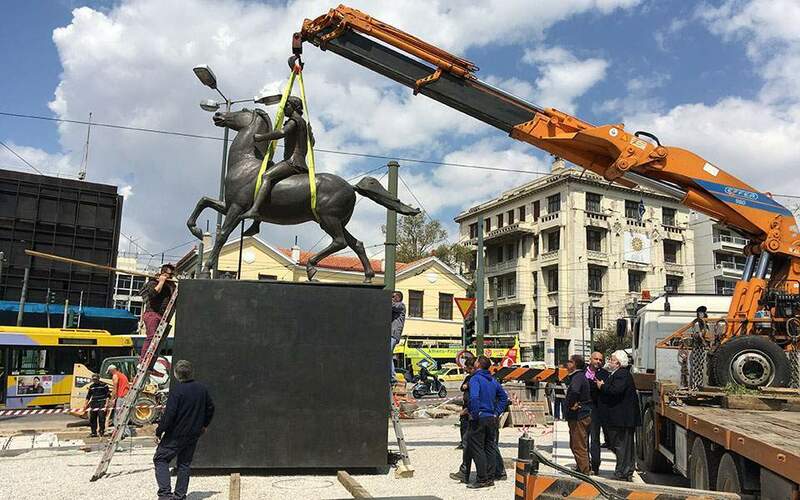 As it happened, sword met with sword and the result was a Greek victory in the countryside by 1908. 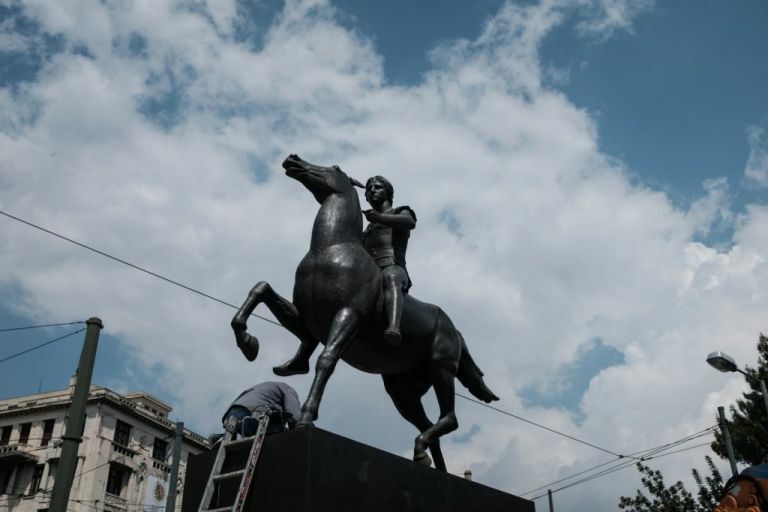 Point of Interest: The testimony of the Macedonian Traikosterio. Where diplomacy fails, only one other solution is available. 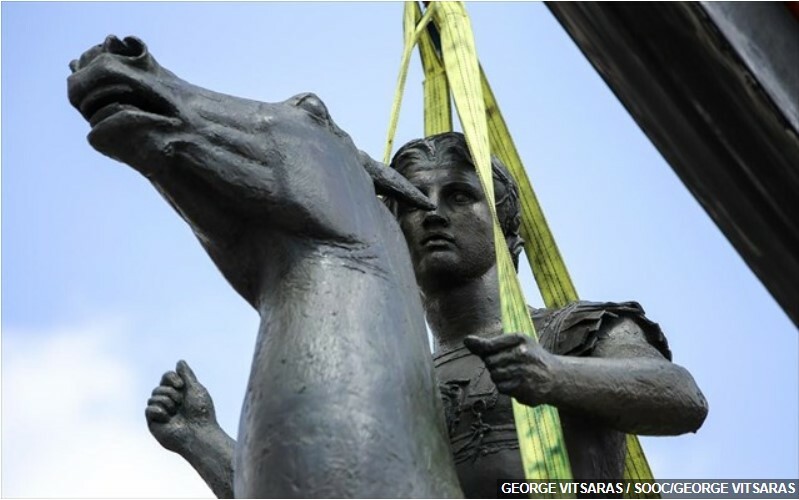 And we all know that in this case, diplomacy failed.